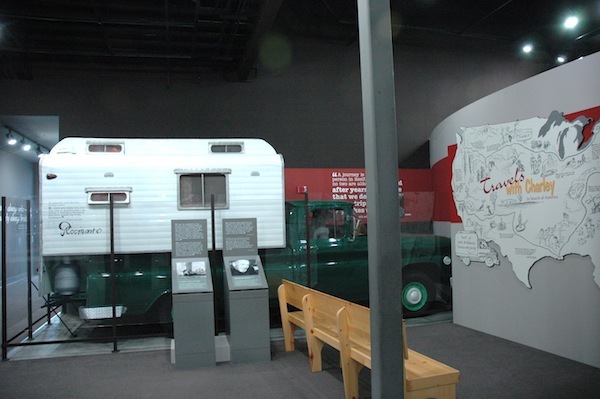 Currently viewing the category: "Travel Writing"
Sept. 25, 1960 — White Mountains, N.H.
Steinbeck says in “Travels With Charley” that he drives east into the rugged White Mountains of New Hampshire on U.S. Route 2 near Lancaster, N.H., and camps on a farm. He says in “Charley” that he talks to the farm owner about the Russians and the boorish behavior of Soviet Premier Nikita Khrushchev at the United Nations. In the book, Steinbeck and the Yankee farmer talk about Khrushchev banging his shoe on his desk at the United Nations, but that conversation couldn’t have happened. That famous Cold War event — if it actually happened that way — occurred Oct. 11, 1960. But did Steinbeck really even camp on a farm? Fifty years later, after searching in vain for the farm and the farmer near Lancaster, a local writer, Jeff Woodburn, learned that Steinbeck was seen in the fall of 1960 at the nearby Spalding Inn in Whitefield. Exactly when that was, Woodburn was not sure. On March 30, 2010, a woman who worked for the Spalding Inn’s owner at the time said she was absolutely certain Steinbeck slept at the inn for one night. And Donald Spalding, the son of the original owners and operators of the inn, said on March 30, 2011, that there was no doubt that Steinbeck ate dinner and slept at the exclusive inn during “foliage season” of 1960. By 1960 cars had replaced trains as the country’s mass mode of transportation. Interstates, truck stops and national motel and restaurant chains barely existed. Wal-Mart did not. America’s fleet of cars had doubled since 1941 to 74 million. About 75 percent of homes owned a car and 15 percent owned two. Automobiles were 4,000-pound death wagons with metal dashboards, crummy tires and lights and no safety gear; 1 percent of drivers used seat belts. America’s highways were criminally lethal. About 36,000 of the country’s 180 million people were killed in or by cars in 1960. In 2010, when there were three times as many autos and trucks on the road and 310 million Americans riding around in them, the annual death toll had fallen to 32,708. John Steinbeck left Eleanor Brace’s house on Deer Isle in on Wednesday afternoon and drove north along the coast on U.S. Highway 1 toward the top of Maine. He called his wife from a grocery store, but where he stopped for the night is not known. It was probably in or near Calais, in northeast Maine on the Canadian border. Waitress Traci Brown takes care of some locals at Karen’s Diner in Calais, Maine. 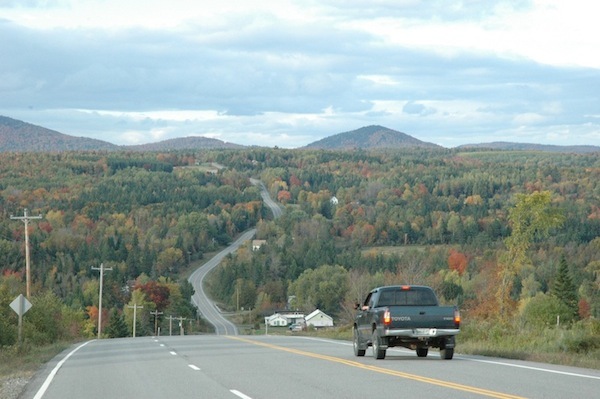 We’ll never know if Steinbeck stopped at the border town of Calais for a bed or a cup of bad coffee, but he had to pass down its main street as he drove north on U.S. 1 toward the top of Maine. Pronounced callous despite or perhaps in spite of its French origins, Calais is in Washington County, the state’s poorest. Across the St. Croix River from New Brunswick, Calais was only 22 miles from my beach resort at Gleason Cove. Its economy was far healthier in 1960, according to one of the local “Down Easters”/”Up Easters” I met at the counter in Karen’s Main Street Diner. The 60-something man, wearing a pristine gold and black United States Army baseball cap, told a familiar story of change and decline. Hundreds of good-paying jobs had disappeared at the paper mills. Young people were leaving and would never come back. The town had lost 25 percent of its population since 1990 and was now about 3,100. Local unemployment was 11 percent compared to the state average of 7.9 percent. If it weren’t for the fact that the department of homeland security beefed up the three border crossings with Canada after it learned one of the 9/11 hijackers entered the States at Calais, he said, there’d be even fewer jobs around. 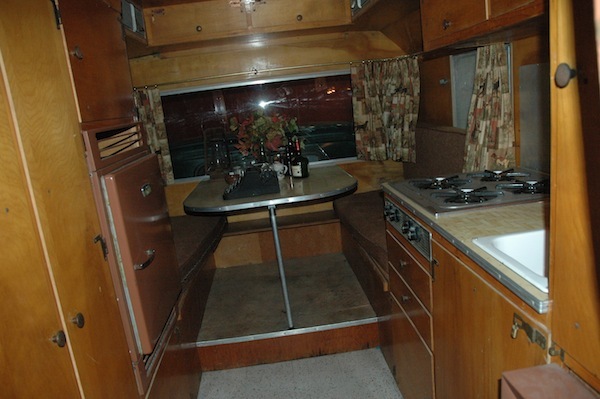 Karen’s had to be the best diner in a hundred miles – maybe the only one. 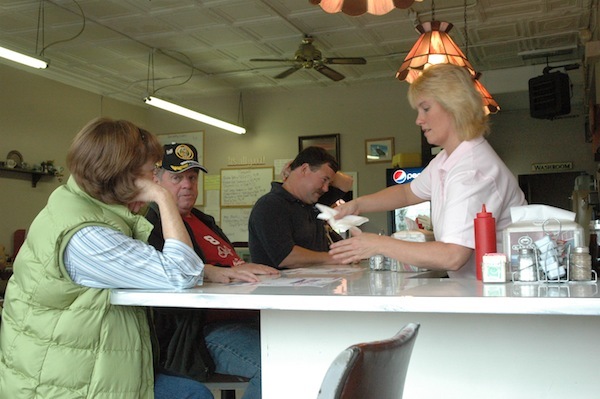 A friendly pit stop for anyone following Steinbeck’s trail into upper Maine, it’s one of those priceless family-run eateries where getting a perfect breakfast is routine, not a matter of chance. I ordered what would become my signature breakfast for the rest of my trip. It was a #2 at Karen’s – two eggs over medium, sausage, home fries, wheat toast and coffee. It cost $6.25 and became the standard against which I compared 25 others like it that followed. Steinbeck wrote that getting a bad breakfast on the road was almost impossible, and he was still right. It’s not a very accurate representation of Steinbeck’s foray into New England, but it makes the point — he went north and east before heading west. From wherever he stopped Wednesday night in northeast Maine, Steinbeck drives north into Aroostook County on U.S. Highway 1. 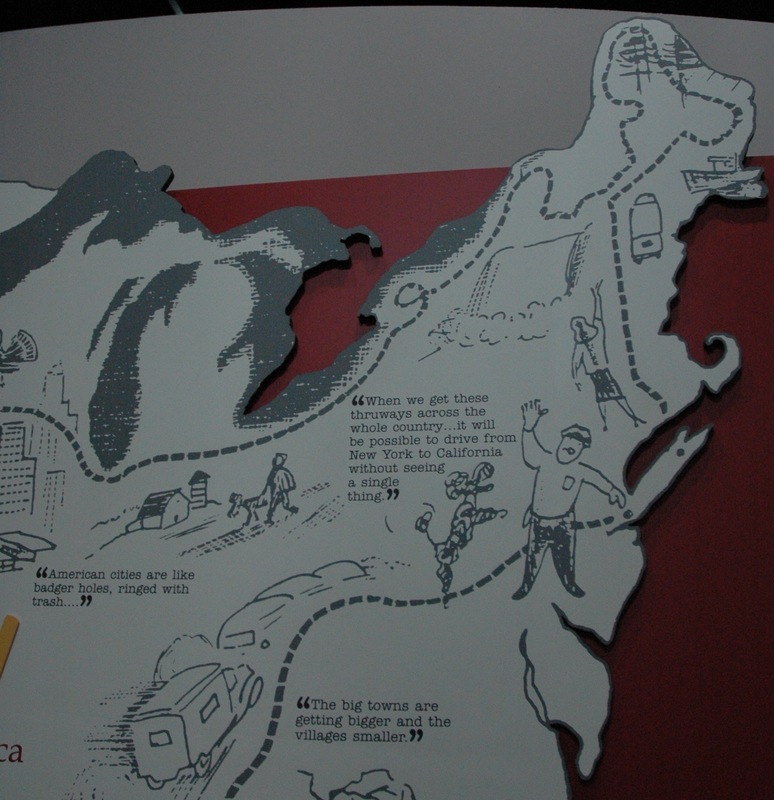 Tracing the U.S.-Canadian border on the south side of the St. Croix River, he reaches the top of Maine, turns south on state Route 11 and plunges deep into the pine wilderness of Maine’s interior. He has to park alone Thursday night somewhere on Route 11 under a concrete bridge in the rain. Aroostook County is famous for two things – potatoes and its enormous size. It’s one fifth of Maine and bigger than Connecticut and Rhode Island combined. No one traveling north from Calais along the pretty St. Croix River would challenge those facts. I was 929 miles from Steinbeck’s Sag Harbor driveway. 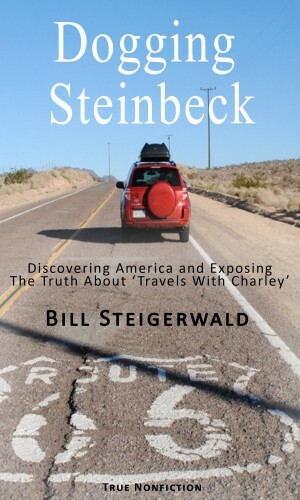 Steinbeck drove the same stretch of U.S. Route 1 on Sept. 29, 1960, exactly 50 years ahead of me. He had a weird thing about wanting to touch the top of Maine before heading west, a weird thing he ultimately regretted as he realized how endless and empty the state was. Steinbeck also wanted to see the famed potato fields of Aroostook County, then the foremost spud-producing area of the country. Maine’s State Route 11, which Steinbeck took south from Fort Kent, is beautiful, empty and devoid of motels, as Steinbeck learned. After 2,400 miles tracing the edge of the East Coast all the way from Key West, U.S. Highway 1 evaporates without fanfare in the town of Fort Kent. 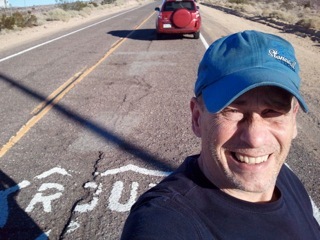 As Steinbeck did, when Route 1 vanished I turned south on state Route 11 for the long haul back to New Hampshire and the way West. 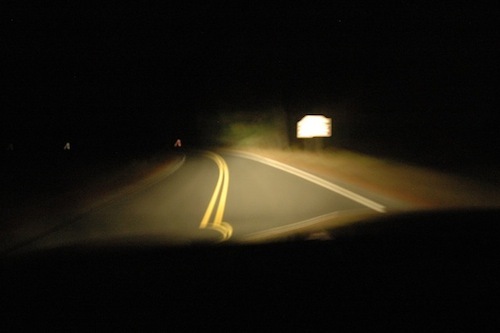 Before I left Fort Kent, I suffered a shock that made me realize what a strange, atypical part of America I had been traveling through. It happened when I saw a black college student on the street. She was the first non-white person I could remember seeing since a pizza shop in downtown Northampton. The 2010 Census tells the statistical tale. The previous three states I had been in – Vermont, New Hampshire and Maine – might be full of color in the fall, but year round their lilywhite populations don’t look like much of the rest of the country. Each had black populations of about 1 percent. The national percentage was 12.6 percent. The same lack of color would be true for other long stretches of the Steinbeck Highway.